DESCRIPTION: Scottish breed of cattle, long horns and long wavy double coat. OCCUPATION: Enduring harsh weather conditions whilst browsing for food. FAVOURITE FOOD: Plants and grass. 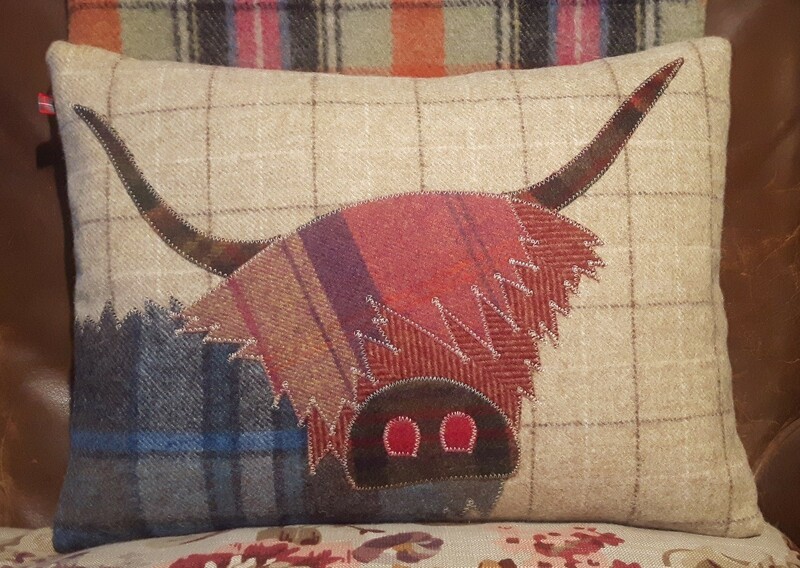 This Highland cow cushion has been designed and handmade by us in our Scottish rural workshop, giving you a truly unique and beautiful cushion. Each cushion is a one-off. This particular Highland cow has been appliqued onto a beautiful cream tartan. Look fantastic as a pair, one body to the left and one body to the right. 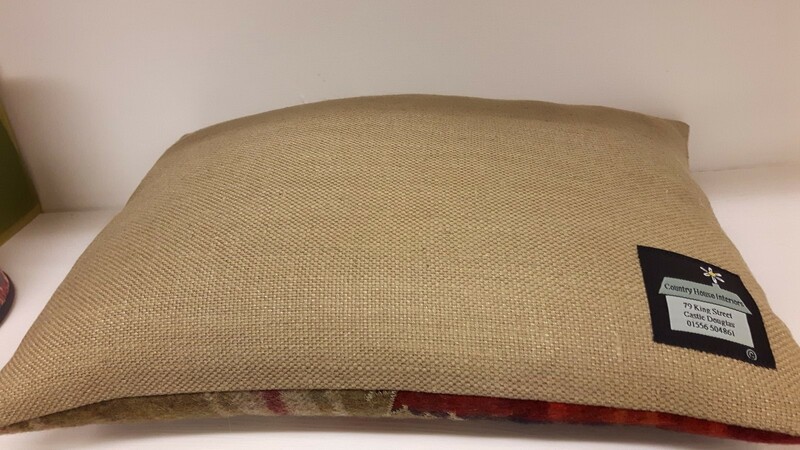 The Highland cow cushion is 38 cm x 28 cm and comes with a feather pad and a linen back. No two cushions will be exactly the same due to variations in the materials used. Free postage to a UK mainland address. 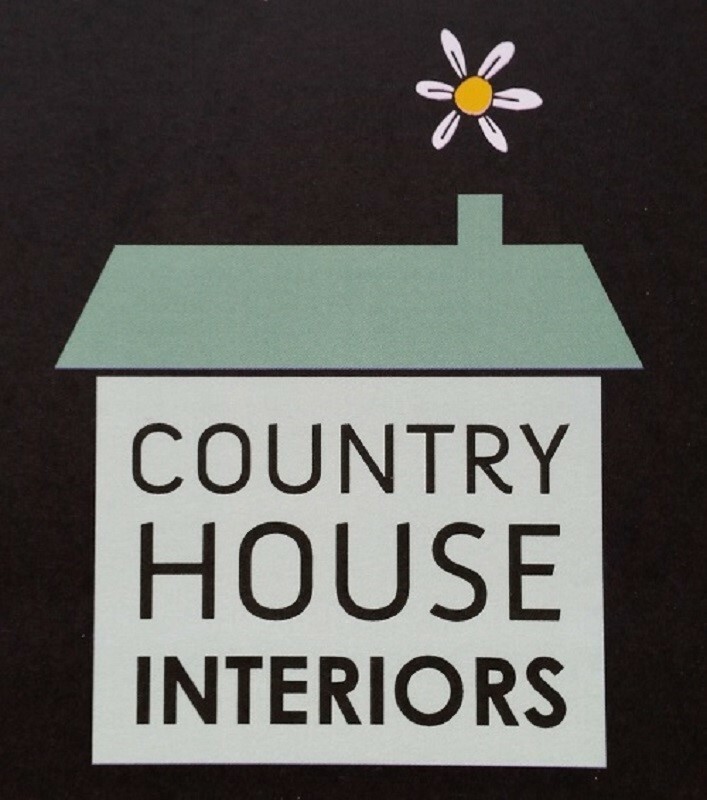 Based in the bustling market town of Castle Douglas in South West Scotland Country House Interiors, established in 2008, offers an eclectic mix of antiques, interiors and most definitely the unusual. 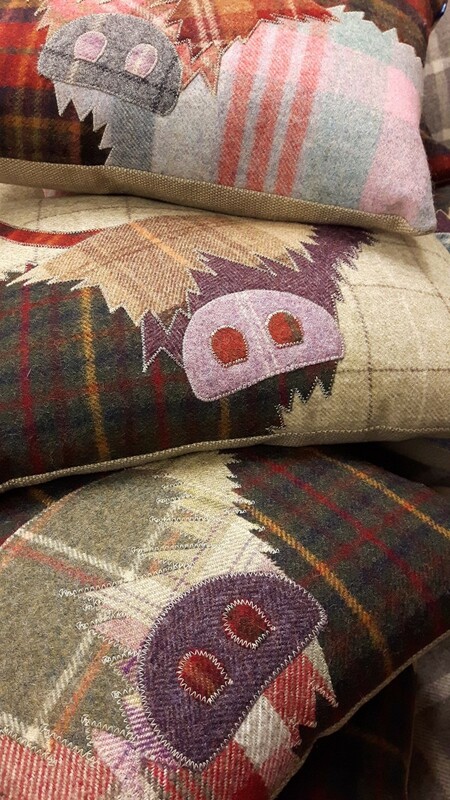 An important and successful part of our business is our unusual cushions, we are renowned for our colourful award-winning cushions which proudly adorn the shelves of the National Museum of Scotland, Historic Royal Palaces, The Burrell Collection and Glamis Castle. They are designed and hand made by an award-winning group of talented women with an eye for colour and sticklers for attention to detail, using only the very best quality materials. A great deal of time and thought is put into every cushion, from the careful selection of wool combinations to the meticulous applique work and hand stitching to a unique, high-end well made cushion and this ethos has been continued and applied to our recently completed sewn Royal and Noble portrait Collection. These cushions and portraits are truly high end bespoke pieces, no two pieces are identical and we hope you can see the pride we take in our work by the standard of the finished item.